Since the official 2015 launch at CES of the revolutionary Polar 3D printer, the customer base has grown at a rapid rate thanks to teachers and students. Now officially in 36 states and over 300 schools, the Polar 3D team is working hard to fulfill its mission of "Inspiring Students to Think Like Entrepreneurs" through 3D printing and design thinking. The Polar 3D printer is the first desktop 3D printer specifically designed for home, school and college use. It's also the first personal 3D printer based on polar coordinates. This design innovation enables it to print four times the build volume of competitors at half the price. And it's lightweight enough, with a built-in handle, that it can be carried friend's house or from classroom to classroom. The Reason for the Rapid Growth? The educational discount price of $599 for a 3D printer makes it more affordable and accessible to schools. Installation in most cases takes between 10-20 minutes. It's incredibly important for teachers not to be bogged down in endless troubleshooting tasks or cumbersome maintenance routines. 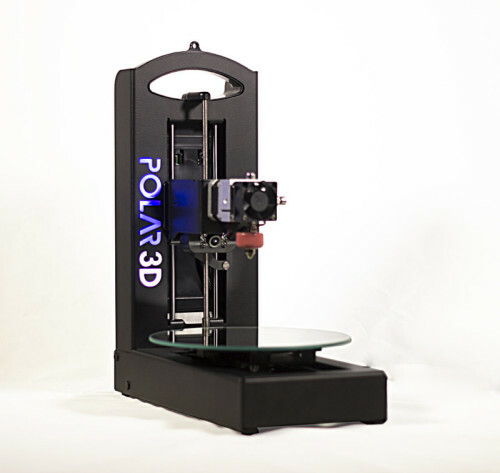 Polar 3D's open view, light chassis and small number of moving parts make it extremely reliable and easy to maintain. Even though the Polar 3D printer looks like it could only print a small golf ball, its radical poalr-coordinate design enables large print volumes. Four times as large as equivalent competitors. The Polar 3D is designed differently than any other 3D printer. It allows students and teacher to gather around and see the 3D print creation being built. "The Polar Cloud is clever and easy to use. More than just a cloud slicer, it serves as a web community where technical support, design challenges, 3D model libraries, and group projects can be shared. “Polar 3D provides a cloud service where you can connect, and control, your printer and even multiple printers. “Since each printer also has a camera onboard, you can see the progress of every print live from anywhere you can gain web connectivity. To go one step further, every print job run is saved in the printer’s history – so you can see information about all the prior print jobs, and – wait for it – you can watch a time lapse” video of any prior print that is automatically saved! In addition to its rotating print bed, the Polar 3D is different from other 3D printers in how you control it. Rather than controlling the printer directly or through a program running on a PC, you run the Polar 3D via the Web, with a cloud interface that puts all of the features of the printer online. This ties in with the educational approach of the Polar 3D, as it allows a teacher to set up and control the printer, deciding which models are printed and in which order. These users (called managers) can also add, remove or alter models and printers, so a group of students can upload models and schedule prints, with the administrator overseeing the process and intervening as required. Gifted educators and students who support the Polar 3D mission, provide support to their peers, and represent Polar to their local communities get discounted rates on the Polar3D printer and supplies. Plus, they have lots of fun, meet and collaborate with like-minded peers. Polar Design Challenges are contests for participants to win scholarships, Polar 3D Printers, or internships at exciting companies. Shop now (shop.polar3d.com) or go to the Polar Cloud (cloud.polar3d.com), sign up for free and get access to the on-going projects, the Polar Cloud collection of objects and monthly 3D printing challenges.